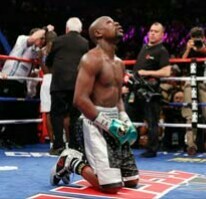 Floyd Mayweather wins his 49th without a lost as he simply took Berto apart, not that this was not predicated. The best one could hope for going into this match was for Mayweather to act his age and maybe Berto strike lightening but alas, it did not happen. Mayweather simply boxed around Berto and at times, Berto seemed mesmerized by Mayweather who seemed to hit Berto whenever he wanted and Berto had enough trouble finding much to hit. As for the fight itself, it was even more one sided as the one-sided scorecards 120-108, 118-110, 117-111. I suspect that two of judges gave Berto rounds for simply showing up but it was hard to give any rounds to Berto other than out of sympathy. I didn’t actually watch the fight LIVE as did others, as I knew it would be a predictable cake walk decision win for Mayweather, and it was. But – I did watch it delayed tape next day. WBC / WBA welterweight champion Floyd Mayweather (49-0 / 26 by KO) easily outpointed Andre Berto (30-4 / 23 by KO) on Saturday night at the MGM Grand Garden Arena, Las Vegas. With his victory, at age 38, Mayweather tied the unbeaten 49-0 ring record of the great Rocky Marciano. The upcoming Mayweather-Berto is one of those fights that would have been attractive years ago when Berto was undefeated and whose career was on the rise. Now, Berto career as an elite championship caliber fighter has been on life support for years and he lost to two of Mayweather previous opponents; so there is little chance that he will win. The Berto who beat Freddy Hernandez five years ago might have the potential of producing a competitive fight but today’s Berto is not capable of providing a competitive fight unless Mayweather fights like he is 59 as oppose to the 39 he is presently. A better question is why did Mayweather chose Berto for his “last fight” and his opportunity for 49 straight victories without a defeat. The answer is maybe, he wanted a chance to pick a fight that he could paint one more Picasso against a fighter who would come to him but not be a major threat to win. It is interesting who he didn’t pick including Keith Thurman, Kell Brook, or Amir Khan among others and some pundits have written that maybe Mayweather should have taken on triple G’s for the Middleweight title. Floyd Mayweather did what no one expected, turn what was supposed to be the fight of the century into a sparring session. 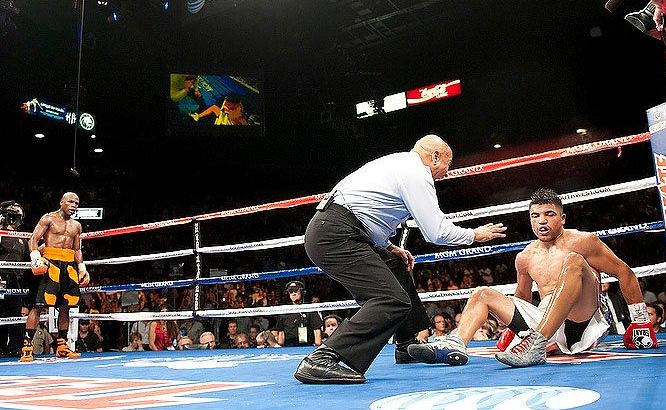 His defensive wizardry was the key as he simply out maneuvered Manny Pacquiao. Mayweather is one of the underestimated undefeated fighter as we pundits consistently find ways that this guy is supposed to lose and yet he simply uses his defensive wizardry and simply turn most fighters into putty in his hand. From the first round Mayweather strategy became obvious; use his jab to establish real estate between him and the smaller Pacquiao while launching occasional right hand. Rarely did Pacquiao ever trap Mayweather on the rope nor did he ever hurt Mayweather. You can count on your hand the numbers of effective left hands that Pacquiao landed and Mayweather managed to nullify Pacquiao’s offense as he did to other past good fighters like Canelo Alvarez and Robert Guerrero. Last month on February 20, 2015 it was made official that Floyd Mayweather Jr. (WBA/WBC welterweight champion) and Manny Pacquiao (WBO welterweight champion) would “finally” meet in a boxing ring after years of talk and speculation. I have always contended that this bout would happen because of the large amount of money it will generate for all. So now this huge match is set for May 2, 2015 at the MGM Grand in Las Vegas, on HBO and Showtime pay-per-view. This fight is the most anticipated in boxing since Joe Frazier vs. Muhammad Ali, March 8, 1971. That fight was billed as the “Fight of the Century” and it certainly was when two undefeated champions met in their primes for the “undisputed” heavyweight championship. 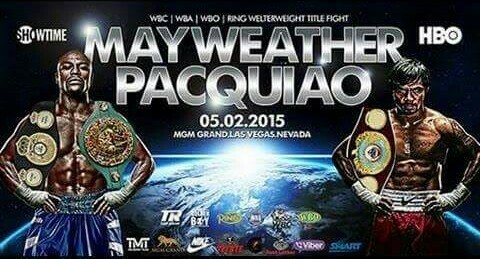 Last week it was officially announced that finally Floyd Mayweather Jr. and Manny Pacquiao will fight on May 2, 2015. The two best boxers of their time, in our time today, will decide who is the best in the ring. I have always contended that this fight would happen because of the huge amount of money it will generate for all. The fight isn’t the most anticipated in my era of boxing , though ; Joe Frazier vs. Muhammad Ali on March 8, 1971 was that. Two undefeated champions at the pinnacle of their careers for the “undisputed” heavyweight championship of the world. 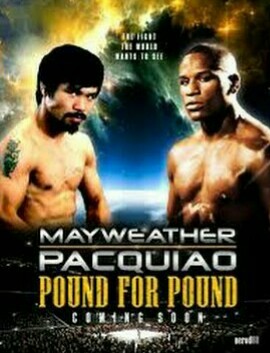 However, boxing will get a big fight with Mayweather vs. Pacquiao. The build up will take us back 44 years to what it was like for Frazier and Ali, and like that fight … this fight is good for boxing in this generation! 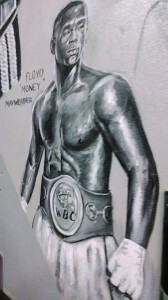 Member Boxing Writers Association and has contributed to dmboxing since 2008. This is the tale of two fighters, one still on the top oft the world and the other may have seen the end of his career as a title contender. There are several things to consider about Floyd Mayweather beginning with his age. Over the first half of Mayweather’s fight with Maidana, Maidana continuously trapped Mayweather but was this strictly due to Mayweather’s age or simply due to Maidana toughness? 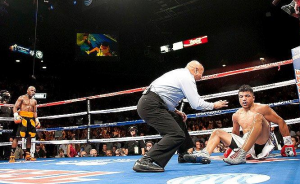 Maidana has shown over his career a fighter who could take a punch and to continue his pressure style. He is a fighter who can’t be denied and Mayweather difficulty with Maidana could be related to his style as much as Mayweather’s age. What intrigue me was the second half of the fight as Maidana slowed down just enough to allow Mayweather to escape. It is usually Mayweather who controlled the pace but in this fight; Maidana set the pace and forced Mayweather to fight a quicker pace. Over the last six rounds, Mayweather was able to escape from Maidana pressure and keep the fight in the middle of the ring. For a 37 year old fighter, he appeared to be the fresher of the two. The one thing positive for Mayweather was his 54% accuracy of punches connected but the negative is that Maidana connected on as many punches as Mayweather. While Maidana connected on only 24% of his punches, Mayweather got hit with more punches than in the past decades and one reason is that Maidana threw twice of punches and kept moving forward throughout the fight. So are we witnessing the slow erosion of the Mayweather skills or was it a case that Maidana had the right style to fight Mayweather? Who does Mayweather fight next? Rule one for Mayweather, which opponent bring in the big bucks? I suspect that a Maidana rematch or Cotto if he gets past Sergio Martinez are the two opponents who will guarantee some big bucks. Another fight is Amir Khan but this only works if Mayweather thinks there is more money in fighting Khan as oppose to Maidana or Cotto. Plus if Mayweather wants to fight in September then Khan is out due to Ramadan. Floyd Mayweather and Saul “Canelo” Alvarez maybe one of those fights that will have boxing fans talking about it for generations. 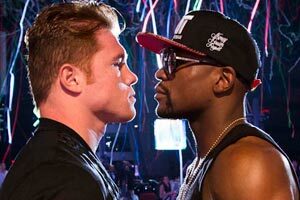 Mayweather will be favored but there is something about Alvarez that gives one pause on whether he is the one to defeat Mayweather. Mayweather started the fight with a jab and he dodged Ortiz punches before landing a couple of body shots followed by flurry of quick hands before Ortiz backed him back. Thus the main event of the $60 PPV began. Mayweather’s quickness showed up immediately but Ortiz managed in the second round to land a solid right hook along with body shots before Mayweather countered with a right. In what was another good round, Ortiz did not back down and may have even taken the round.